Aquafactors has produced a revolutionary hot wash window cleaning system – hot water window cleaning for water fed pole use – in conjunction with Krueger, a leading British manufacturer of specialised heating systems. 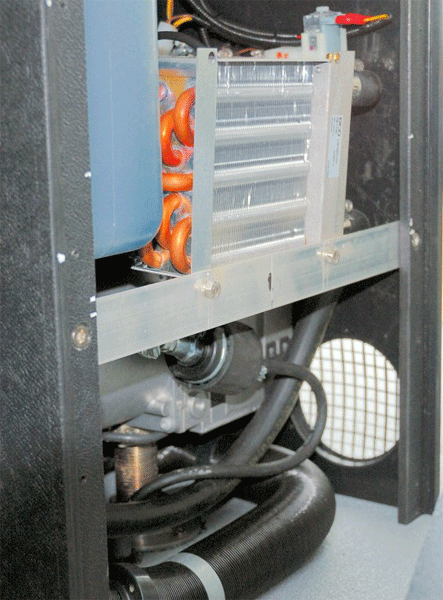 The 12Kw Aquafactors Hot Wash is the most powerful in the market and has a continuous flow rate of over 13 litres a minute to temperatures up to 65°C. The use of warm pure water with water fed poles is becoming ever more popular as “all weather” cleaning is more practical, particularly in winter. Compared with cold pure water, hot water window cleaning removes stains on glass more easily and quickly, and water tends to evaporate swiftly; a very much more acceptable set of circumstances from the customers viewpoint. It also works very well on metal surfaces such as cladding and for masonry cleaning. 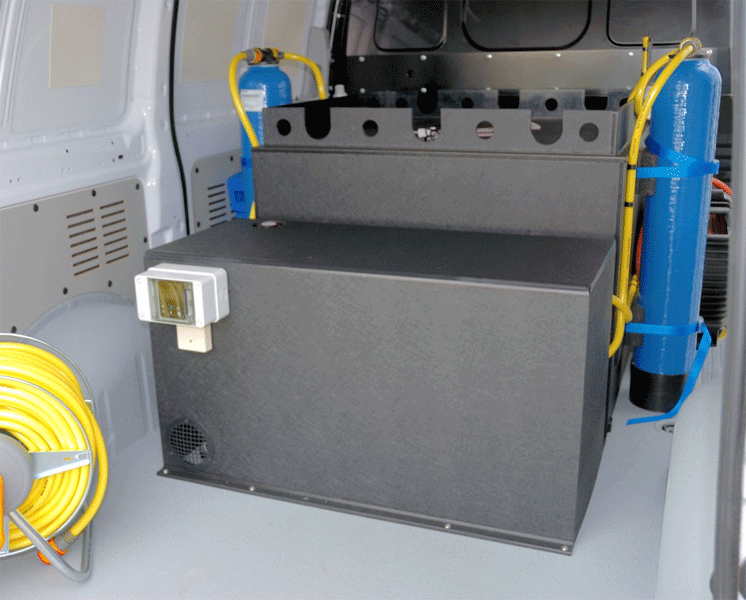 Water heating is powered by a Eberspacher Hydronic water heater which draws its fuel from the vehicle diesel tank. The whole system is supplied (and fitted) as an independent unit and is available as an “add-on” to Aquafactors water fed pole equipment and can also be retro fitted to competitor’s vehicles. Fully adjustable timed switch–on (which takes about 9 minutes to be at full heat). Water can be flexibly adjusted to any temperature between 20 and 75°C. Once set, the system will maintain that temperature within 1½°C consistency. The controller has a built in “Froststat”. This automatically cuts in at 2°C and diverts heat to a 2Kw matrix fan heater. This then blows warm air around the inside of the vehicle to prevent equipment freezing. 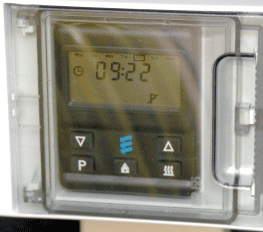 The controller accumulates and displays the hours that the system has been running. This enables reliable service intervals of 1000 hours to be easily calculated. The controller has an integrated diagnostics program with fault indicator. The controller will safely cut out if the service battery charge indicator falls below 10½ volts to prevent cell damage. In operation the Aquafactors Hot Wash hot water window cleaning system will provide continuous hot water, for two poles, at a set temperature, with flow rates of up to 6½ litres per minute for each pole, or as set via the Varistream controlled pump. Most other hot water window cleaning systems allow for single pole use only. With an Aquafactors Hot Wash hot water window cleaning system, even if the water supply is temporally switched off, at a pole, the heat of the water will not be interrupted and the temperature will remain constant. This is assisted by the excellent polyurethane closed cell insulation material used throughout the equipment. The heat storage system on the Aquafactors Hot Wash hot water window cleaning system uses far less fuel than other systems on the market and trials have shown an average consumption of 0.65 litres of diesel an hour. This is about 40% less than with some plate exchange heaters. The Aquafactors Hot Wash hot water window cleaning system is beautifully put together. The equipment meets a full testing protocol including a pressure test at over 7 bar. Servicing is minimal – every 2 years or 1000 hours, whichever is the sooner. There is a three year parts and labour guarantee excluding consumables. The exceptional build quality, ruggedness, low maintenance and consistent performance makes the system easy to use whatever the weather conditions. Satisfaction is guaranteed.